Im thinking of getting a new 22lr revolver this year. 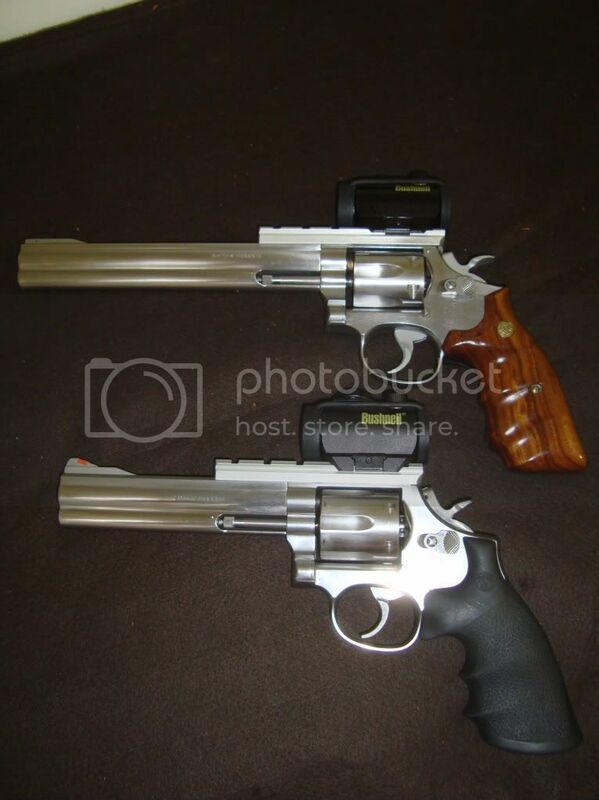 The revolver im thinking of is S&W 617 or the Ruger GP 100. I havent handled non of them. I have tested the 686, M17 before and liked them. But my question is have you any experience of them even bether can if there have been any problems. If you have would pic one, wich one? I will probably have 6 inch barrel. It depends on what you intend to use it for. If you want a well made elegant gun for target shooting and small game hunting then get the S&W617. However, If you intend to repair a barbed wire fence by using the but of the gun to hammer in new staples then the Ruger GP100 would be the better choice. Seriously, to get the Ruger timed, forcing cone recut, and trigger smoothed would cost you another $1,200 and it still wouldn't be as good as the Smith. I don't have anything against Ruger pistols in general, they are rugged and dependable but are not in the same class as the Smith. If you were to talk semi auto 22 pistols then the Ruger 22/45 is better than the S&W Victory which are competing pistols in that market slot but the S&W 41 is a huge step up compared to either of those. If you are a left hand shooter, as I am, then get the Ruger. The reason I say this is that when holding the revolver in your shooting hand, if left handed, you use your trigger finger to press the cylinder release. This is much easier to do with the Ruger as you push down towards the frame instead of pushing forward towards the muzzle as you would on the S&W. Being left handed I find the Colt's and Ruger's the easiest to manipulate and the S&W's and there various clones the most difficult. Only ever owned one Ruger revolver and that was enough for me to concur with what Stokesrj said. Im righthanded guy shooting (dominated righteye, writing with lefthand.....). So problem using both hands. My use will be precisionshooting on target at 25m range. Perhapes some hunting in the future. As i have foind out there are more aftermarket stuff to the smith. And havent checked the ruger yet in real life but as u say its more like sledgehammar then a gun. But its realy giving to get a second opion from you guys that have big knowledge of both recolvers! Are Semi Auto pistols not allowed in Sweden? The reason I asked is that the Ruger standard auto, now in MKIV configuration is much more capable for precision target work. The revolvers have the disadvantage of each chamber in the cylinder having the opportunity for misalignment. One or more chambers may shoot to a slightly different spot from the others. It is possible to line fore the chambers in the cylinder so that they are in perfect alignment with the bore but this is very costly. The only US revolver to my knowledge manufactured this way is the Freedom Arms model 83 and 97. The model 83 .22 LR dominates the small bore handgun metallic silhouette competitions followed by the Ruger standard auto and Browning buckmark, both of which are readily upgraded with components from Tandem Cross and Volquartsen. I like the model 83 so well I have three of them, they are truly unique in revolver accuracy. I too am a right eye dominate lefty but I shoot two handed and am not a precision shooter. I can't speak to the GP100 in .22 LR but I do have and shoot a GP 100 Match Competition. I find that it shoots well is accurate and has a very nice trigger. Semis is legal in sweden but i shoot bether with revolvers. I sold my Beretta 76 and my CZ 85 duetone cause i nevee got any high resolts with them. Borrowed a old smith and made higher resolts directly. Thats why im changing from semis to revolvers. Don't get me wrong the 617 is a great gun, I just thought you might want to consider the Ruger 22/45 and it has now been upgraded to the MKIV version which overcomes the difficult dissasembly/reassembly issues of the MI, II,and III. I have a 10 shot 617 with a 4” barrel. I had to send it back to s&w because the entire barrel was twisted! I couldn’t understand how that got through qc. I sent it in and 3weeks later I got it back. It’s a nice gun and a lot more fun with a couple of speed loaders. If you compare the balance with your 4 inch due to a 6 inch wich one do you think has the best balance? I only own SW 617 -6 rd - 8 in ,and a SW 41 and owned some Buckmarks , no Ruger . My personal preference is the revolver . This is a really nice revolver . I installed a Busnhell Micro Red Dot with a Weigand mount , and a homemade customization of hammer and trigger with Wolff Gunsprings Kit . It shoots very well !! My 617 has wood grips . For shooting I prefer rubber grips , but wood has a very nice look . There's something nice about a revolver, I've only ever owned semi's and really regret not buying a revolver when I still had my license. If I ever get it again then I'm definitely buying a revolver but for any rimfire shoots I will still have a Ruger 22/45 as they are by far the best value for money and hard to beat. But a revolver would also be nice if i can justify more then one. I'm not much of a Ruger fan so my choice would be the Smith!